Can you run a knife? Drive a stove? Hang onto a spoon? Yeah? Well then, kitten, you can make a mighty mean pot of hot and sour. In terms of ease it’s the split pea soup of China. Easy prep, easy cook, and you’d have to really apply yourself to screw it up. Don’t let the hot part scare you off. It’s not hot in the conventional sense. The “hot” comes from white pepper which is identical to black pepper but for one detail. Peppercorns for black pepper are harvested from the tree when nearly ripe and allowed to dry in the sun so that the outer skin, the pericarp, oxidizes and turns black. That’s what gives the black pepper its black. White pepper is made from peppercorns that have been dried and then lovingly rubbed by silky handed virgins to remove the pericarp. White pepper still tastes very similar to the black but seems, to my palate, a bit more refined. Think of it as perfectly pampered pepper. It’s used extensively in Asian cuisine because it won’t feng your shui. This is a dish that will convince guests and loved ones that you are a closet chef. Of its many pluses, the plussiest plus is that you can make it using ingredients that have a decent shelf life and won’t require a special trip to market right before making it. A block of tofu, a can of bamboo shoots, a can of shiitake mushrooms are the most exotic ingredients required. Put the broth on the stove and set it to medium for a slow simmer. Add the soy sauce, vinegar, and black pepper. Dump the tofu in and and stir it up real good. Cut the mushrooms into thin strips, about 1/8 inch wide, the size of matchsticks and toss ’em in the pot. Cutting the canned variety is like slicing jellyfish, careful! Slice the bamboo shoots into 3 or 4 matchsticks from each flat slice as they come from the can. Heave ho, into the pot they go. Now crank up the burner to sorta not quite high to get a good almost boil going on. Stir the pot so you get a good cyclone going and pour the eggs in a stream over 5 to 6 seconds. Stir a bit more to incorporate the eggy goodness. Serve some up in a bowl and drizzle in a li’l bit of sesame or chili oil if that kinda thing pleases you. Wanna get all fancylike with it? Throw in some crispy fried pork matchsticks, slivers of bamboo shoots, grated carrot or daikon, gold leaf, etc. Survey says? You’re a genius! After eating, I leave the pot on the stove top overnight. The flavors magically mingle and and magnify when you’re not looking. It’s a great breakfast on a cool winter morning. 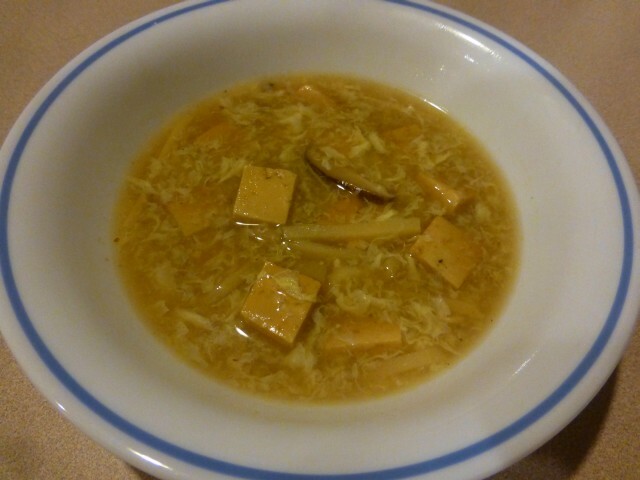 This entry was posted in Cooking, Food and tagged shiitake, soup, Tofu, white pepper by Foxfur. Bookmark the permalink.